On the unofficial scale of Badass Truck Names, “Iron Knight” is quite high up there. It seems only fitting that the truck upon which the name was bestowed is also badass. 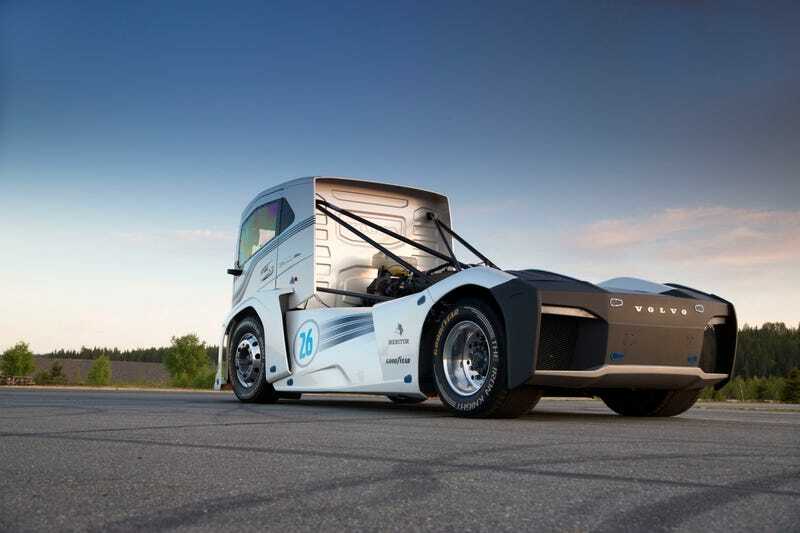 In August, the Iron Knight took home not one, but two official speed records for trucks over 500- and 1000-meter runs. It cracked 500 meters (0.31 miles) in just 13.71 seconds and 1000 meters (0.62 miles) in 21.29 seconds. Behind the wheel was Boije Ovebrink, professional car and truck racer. The runs were carried out at “Skellefteå Drive Center” a former airfield outside Skellefteå in northern Sweden. The speed record was monitored and approved by the international motor sport association, the FIA. The truck covered the distance in both directions. Based on these two runs, the average time and speed were calculated. The record result that the FIA presents is the average speed of the two runs. Weighing in at 4.5 tons, the Iron Knight has a mid-mounted engine that produces an earth-shattering 2,400 horsepower and 4,425 lb-ft of torque. It has four turbochargers. Power is delivered through a dual-clutch gearbox. Custom-built, it’s unlikely that the Iron Knight will ever see the light of production. Sad! The Iron Knight ran over the summer, but that doesn’t make it any less cool. CORRECTION: This post originally had the truck’s torque at 6,000 lb-ft, which is actually the torque in Nm. Converted, that’s 4,425 lb-ft and the post has been updated to reflect that.